I wanted to let you know that we had another fantastic sailing vacation in Croatia thanks to your support. The catamaran you recommended for us was in superb condition making it another worry-free and very comfortable vacation for myself and my crew. Thanks again for all your help. I wanted to thank you for organizing our cruise. Please see below the feedback about the cruise with Maritimo. "They were extremely pleased with the cruise. The captain was very friendly, helpful and giving constantly details about the itinerary. I suggest: to have the full itinerary of the cruise on the screen rather than only the infirmary about each island on a daily basis. His speech at the captain's dinner was very appropriate and informative. The rest of the staff was very pleasant, always ready to help with a smile. The housekeeper was very efficient and very quick to grt the rooms ready by midday. The tour manager made a lot of efforts to explain to the group and to explain in several languages all the details whenever he was asked. The selection of the lunches and dinners were quite good. However a little bit too sophisticated for a crowd that includes children. May be a kids menu should be introduced once or twice during the cruise. Also the buffer style was very much appreciated. May be it would be a good idea to have it more than once. Above all a very successful cruise." A special thank you for setting us up with Marin. He is such a great young man! Great driver, excellent service, and a wonderful service oriented attitude. The day today as almost as special as the sailing! You and your company should be very proud of the people and your Country of Croatia! Dear Karmen, Thank you for everything. The boat was great and the crew very nice. And of course Croacia is fabulous !!! sa malim zakašnjenjem bih se zelio još jednom zahvaliti na pomoći kod charter broda Fantazija. Gosti su bili vrlo zadovoljni i sa brodom i sa posadom. It’s hard for me to believe that we were there and gone- seemingly in a flash. We had another absolutely amazing trip and I want to thank you once again for all you did to facilitate that! You’re always so helpful and quick to answer my many questions as we plan. Thank you!! Goran and Gordana were amazing again. We felt they both went above and beyond to make our week wonderful. They’re very special people and we are lucky to have connected with them. Gordana is a great cook and has the happiest spirit you can imagine and Goran is of course a very capable skipper and makes one fantastic suggestion after another. They’re such a delight to have on board with our family. We love them!! We’ll definitely come back as there’s so much more of your beautiful country that I want to see. I think it’s going to be hard to get rid of us! Thank you Karmen for all of your help. We have the most AMAZING and memorable vacation ever!!! I wish I was still on the boat and still in Croatia! I love Croatia and absolutely will be back! Greetings from a really cold Johannesburg!! Well now feed- back on our trip. Thomas was an incredible captain and host of Malema, while Luca, Frane and Ivan looked after us like Kings and Queens. Nothing was too much trouble for any of them and we were truly treated and spoilt for the week we were in their company. They are individually such special men with such good hearts, a good sense of humour and sense of fun. The captain and crew are an essential ingredient to a trip. They can either make it or break it. This team was professional always, yet made it feel as if we were all family. Thomas was a huge help with ideas on local restaurants etc. and managed our daily island excursions with precision. He was in constant contact making sure we were always alright. The cabins took a little getting used and I must admit, R. & I would have had a problem storing our suitcases if the fifth cabin had not been available. The food was totally incredible and Luca is a master in that tiny galley! We all wanted to bring him home with us hahahaha Not one person out of the group complained, or had a bad comment about the food on board, and that from our “foodie” group is amazing. The group did give Luca a standing ovation on our last day☺ Frane & Ivan kept everything in tip top condition and where at our beck and call at any time. They were persuaded to join in the revelry one night (our only night of singing and loud music I might add) They were good fun and kept a careful eye on us. Ivan also learnt that we like lots of coffee & tea with milk hahahaha He also introduced us to Pipi which was delicious and which soon B. was pairing with vodka!!! The only constructive criticism I would make would be about the timing of your island disembarkations. For example: There was a lot to see and do on Mjlet and we were not aware of the time constraints with the water taxis etc. (only coming around every hour) which delayed us quite a bit. We had a rather energetic group, so they would have liked to cycle around, even hired a kayak and we would have gone for a swim in the warmer lake as well. But we only got to the island later after having rested after lunch. So, all we managed doing was seeing the monastery before having to get the bus back to the boat and then going to the restaurant for dinner. We really missed out on walking and experiencing the beauty and peace of the island. A few of our group were not so happy. We did speak to Tom at the time about it, and from then on, he was aware of the groups preferences. Some did go off early, while others remained on the boat as per their preference. So out of the whole week, literally that would be the only suggestion: would be to find out from your guests whether they would like to rest on the boat after lunch/ have a swim or go straight on to the island to explore. Depending on the island and where you are obviously. Croatia is beautiful with wonderful people and we are blessed and fortunate to have had the opportunity to visit and experience just a little of what Croatia has to offer. We will have to come back! Thank you Karmen for all your advice along the way and for patiently dealing with all our questions☺ It was a truly memorable holiday, one which we have recommended to many of our other friends and colleagues. We have named our group the Živjeli Tribe ☺ Please pass on our best wishes to Thomas, Luca, Frane and Ivan for us.Take care. I can't say enough about the wonderful time that we had! You arranged the perfect trip for our active family - Sunny was engaging, knowledgeable and routed the perfect destinations- V was joyful, experienced and a true pleasure to have with us! The boat was exactly as described and spotless. We fell in love with Croatia for its beautiful landscapes and friendly, hospitable people. If we ever come back we would 100% book with you again and should anyone ask - you will be highly recommended. A few minor things from a family that has done over 5 catamaran trips. We had such a memorable trip - Thank you for your attention to details and excellent correspondence. You are a true professional! Yes, the captain and his crew were very accommodating. We had a wonderful time on the boat. The final drive in Dubrovnik was the best--very helpful and easy to work with. All in all, it was a wonderful trip. Thank you for your assistance and work; our students really enjoyed their time in Croatia. I would like to thank you for everything! We had an amazing experience at the Catamaran. Ante, the skipper was very professional and knowledgeable and a very nice person. Neli was a fantastic cook and great hostess. I would definitely recommend your services to anyone. Thanks again for your professionalism and for taking good care of us! Everything was great! I have travelled the world and this vacation was the best. Dejan and Tina really made our trip so special. Thank you for connecting us to this yacht and to Dejan and Tina. Truly amazing! Everything was perfect, standard of the ship, food, service. The crew was very nice, service minded and helpful. My wife and myself and all the guests was all very impressed. Thank you, we really enjoyed the tour! Thank you very much for the message and the good wishes. And thank you for checking in with Nik during our trip. It is impossible to order perfect weather but all the rest were pretty much perfect. We were surprised and delighted by Croatia. It is stunning. The history is remarkable and the food delicious. The people were friendly and engaging and very down-to-earth. This made travelling easy and relaxed. We had a wonderful experience with the Andeo team. They are world-class. It was a privilege to sail with them and really respect the love and care Nik and the guys dedicate to maintaining the Andeo and offering a 6-star service to their guests. Vedra's food was, of course, a highlight. I suspect they are a unique team and agents are lucky to manage them. Thank you for securing the Andeo and for making the entire process easy. Your professionalism and always-available approach made it a pleasure to deal with you. Our very best wishes to everyone. Back home after a long trip. The cruise was excellent. Captain Panos showed us some beautiful sights and was a pleasure to sail with. The chef on board John Paul was fantastic serving excellent meals.Over all a great experience and would recommend that boat to anyone. Maybe another charter in Greece or Croatia could be in our future. Thanks for all your help as always. We have finally come home from one amazing trip. Croatia is so beautiful, Words can not describe the beauty and richness , the culture and history it has. It really does not compare to any other country that we have been to through Europe. I can’t thank you enough for making our trip through Croatia the most pleasant ,beautiful , wonderful ,amazing , experience for us . Looking back now and reflecting on our journey brings me tears of joy. Thank you from the bottom of our hearts for your help time and effort. I hope to see you again in the near future. I wish you all the very best that life has to offer you, you are so good at what you do, the biggest thank you . God bless and See you soon one day. We have finished our weeks holiday on the yacht, Nimado, which was a great success, thoroughly enjoyed by all. Naldo was a wonderful Skipper, lovely man, very kind and generous with his time. He brought us to the most beautiful places, looked after us so well and yet was very respectful of giving us our own space. Thank you for all your correspondence and patience during my time organising the holiday. This is just a quick email to say that we are back home in Johannesburg. Thank you very much for your assistance with booking our Katarina cruise and our stay in Split. We nearly arrived late for the boat departure but everything else was enjoyable and perfect. Thanks for your professional and personal service. We will surely recommend all of our friends and family to you. mi ero ripromessa di scriverti al piu’ presto dopo il rientro, ma il lavoro è tanto e sono stata travolta. Non so se hai gia’ sentito mio marito, le due settimane sono andate per il meglio, la vostra terra è talmente affascinante e accogliente che si soffre di “mal di Croazia” per tutto il resto dell’anno. La marina Baotic è sicuramente un posto caotico, ma l’appunto che farei al Direttore del Customer Service ( ... ma credo fosse un agente per vendita di barche) è la scarsa attenzione o accortezza che contraddistingue tutti gli operatori a tutti i livelli. Non sono in grado di dare una risposta valida, né tantomeno cortese, a qualsiasi richiesta si stata da noi inoltrata. Comunque, le ore trascorse al check-in sono state subito dimenticate …almeno da parte mia! La barca non era accessoriata come quella di Nava in cucina pur essendo piu’ nuova e con tutte le “tende” perfettamente funzionanti; c’era il cibo degli ospiti precedenti lasciato a bordo ( utilizzato e non ), è stata pulita in modo superficiale. Il wi-fi è stato aggiustato dallo skipper, il doccino esterno era rotto. Per il secondo anno abbiamo avuto problemi con l’energia: ogni giorno è suonato l’allarme, nonostante avessimo escluso il frigorifero esterno. Il fuoribordo era migliore di quello dello scorso anno. Credo che anche il serbatoio dell’acqua fosse solo parzialmente utilizzabile perché abbiamo dovuto ripristinarlo piu’ volte. I SUP affittati erano perfetti e semplici da gonfiare. Lo skipper è stato decisamente valido ed ha fatto la differenza. Siamo al terzo anno, con tre settimane all’attivo in Croazia, quest’anno abbiamo scelto il periodo piu’ intenso anche se cio’ che piu’ ci piace è restare nei posti isolati, è riuscito a farci vedere tutti posti mai esplorati, ha accontentato perfettamente il nostro desiderio di stare con gli amici o di andare nei porti solo se necessario ed ha saputo navigare quando il mare non era “ottimale” in modo che i bimbi non ne risentissero. Piacevole nella conversazione e discreto nella presenza a bordo, è stato anche molto coinvolgente e disponibile con i bimbi ( considera che ad un certo punto, in tre catamarani, avevamo 13 bimbi!). Anche i P... sono stati estremamente bene con Tonko e, sono certa, saranno tuoi clienti il prossimo anno per almeno due settimane.Ho anche un’altra famiglia di amici che ti contattera’ per la prossima stagione, ma ti avviserò prima. Sappi che sarebbe mia intenzione ( desiderio/sogno) poter fare tre settimane il prossimo anno: l’idea sarebbe di portare mia madre e i miei suoceri la prima settimana e trascorrere da soli le successive due. Lo skipper diceva che, visti così tanti gg, si potrebbe pensare di fare la prima settimana con uno di loro e la seconda e la terza con un altro. Certo, dirti questo con ancora la stagione in pieno svolgimento è paradossale! In ultimo, non so se hai mai ipotizzato un viaggio in Italia e un passaggio a Pescara, qualora fosse nei tuoi progetti, ti aspettiamo a braccia aperte, pensaci! Buon lavoro! A massive thank you for a truly amazing week. Every day has been great. We have loved the gentle pace of the trip calling in at most beautiful islands of Croatia. Our crew have been fabulous. Zoran has been an excellent skipper, Tina has been so kind in looking after us and we have the best chef in Croatia. Great food every day as good as any top restaurant – well done to you all! Holiday has been a perfect way to spend my husband birthday! A great choice for our family as we have enjoyed the variety! Sedna is the perfect boat for this trip. We have appreciated the ample shade at sunbathing space. Thanks again for making our holiday so memorable. wenn jemand eine Reise tut, so kann er was erzählen... Ein wunderschöner Urlaub in einem wunderschönen Land liegt hinter uns. Wir werden von der einmaligen Inselwelt Kroatiens, Herzlichkeit der LINDA -Crew, ausgezeichnetem Essen und exzellenter Betreunung erzählen. Vielen herzlichen Dank für eine bestens individuell organisierte Reise. Tolle Reiseplanung sowie perfekte Durchführung. Wir freuen uns jetzt schon auf den nächsten, von Ihnen organisierten Kroatienurlaub. We are back home now and I just wanted to follow up with you regarding our trip. It was such a fantastic week on the boat. The boat itself was great and as I previously mentioned- Goran and Gordana were wonderful. Goran took us to places we never would have seen and made some lovely recs for restaurants as well. We always felt like we were in good hands with him. Gordana was cheery and positive and just a lovely soul. It’s a funny thing sharing a small space for a week with 2 complete strangers. We considered ourselves fortunate to have a skipper and hostess with whom we enjoyed spending time with. Corneraro (perfect location- we had a great day/night in Split). We all absolutely loved Croatia-the people, the culture, the natural beauty of the land/sea, and the cuisine. We all want to come back next summer as it’s a very special place! If we were to book another boat, do they give discounts to repeat customers? I know some places do and others do not. How early do people begin booking for July ’18? Many thanks again for all you did to help us have an amazing vacation! I will be sure to recommend you to anyone wanting to go to Croatia!! Thank you for organising our company training. We're really satisfied. It was a great pleasure for Us. Hope we'll keep in touch in the future. Best regards, A. from V., Hungary, June 2017. We are home again after our 2016 holidays in Croatia and Italy. We want to thank you for your help in chartering Linda. It was an excellent boat and we thoroughly enjoyed our time on board. Captain Tony and the other 3 crew members made us feel very welcome from the moment we boarded and they were most friendly, helpful and accommodating throughout. The boat was very comfortable and the standard of service and food (wow!) was excellent and way above the level we expected. The choice of ports and moorings were varied and most enjoyable and I can say that the overall experience was simply fantastic. Thank you too for your assistance. You were very easy to deal with and understanding of all our problems and needs. I can certainly recommend ACANTHO as a tour operator. We would appreciate it if you could pass on these words to Captain Tony and convey (again) our appreciation for his input to a most enjoyable holiday. Cal and I and our entire group wanted to thank you from the bottom of our hearts for all of your constant and generous travel tips and bookings for our holiday. It is not often that you can find such willing and ‘going-the-extra-mile service’ these days. We are very aware that we were calling you initially to just book a boat, but what we got was a full-time travel agent. The booking of the van, which we absolutely adored, before and after our sail was perfect, all of the hotel recommendations and bookings, and all of the restaurant help was perfect. You converted us wholeheartedly to your beautiful country of Croatia and it’s genuine and warm people - but especially to Acantho services. We will definitely be a return customer and will be spreading the word of where to get travel services in your amazing country! Back home, very happy and just a little older. Our sailing in archipelago Dubrovnik-Primosteen was fantastic and big part of my thanks go to our skipper. He is a nice and good man, polite, helpfull and very skilful. I also like to thank you for all help for this journey and for me it's a pity, that we never met. Very warm greetings to you and our Skipper Goran from the "Team Finland"
Ivana- I had meant to email you and thank you for all of the arrangements. We had a terrific week. Marko was fantastic and we would recommend him wholeheartedly to anyone. We already have friends asking about our trip and we will definitely recommend your agency and Marko. We especially appreciate your prompt communication about the boat and all the transfer arrangements. Stvarno nam je bilo lijepo na Romanci. Bili smo totalno odusevljeni, od samog broda do kvalitete posade koja je za svaku pohvalu. Andrea i tim su stvarno prvoklasni domacini. Srdacan pozdrav i hvala na javljanju, moram reci i da je i s vase strane posao odradjen vrhunski profesionalno!!! Meni je drago kad naidjem na pametne i sposobne mlade ljude, to me veseli. I have two pieces of feedback. One for Croatia Charter Holidays and one for the Alba. 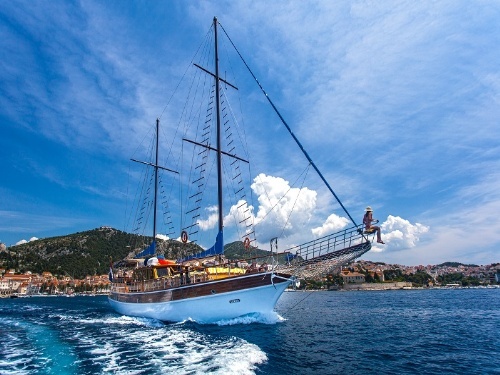 From the moment we decided to book a holiday on a Gulet through Croatia Charter Holidays the level of service provided by Ivana was exceptional. She responded quickly to all our communications and was incredibly informative about everything we needed to know. Nothing seemed too much trouble from organising transfers to rescheduling arrangements when some of our party were delayed. We would highly recommend booking through Croatia Charter Holidays after this wonderful experience. We had the most amazing week on the Alba in late June 2016. We were a travelling party of nine, two families with teenagers. This was our first crewed yacht charter and our Alba experience and the wonderful staff far exceeded any expectations we had. The Alba itself is a gorgeous boat, beautifully equipped and maintained and providing spacious and comfortable sleeping suites and en-suites and enough living spaces to accommodate everyone. But what made our week was the staff- Mirko, Tash, Zlatko and Stipe. Nothing was too much trouble and we felt like their aim for the week was to give us the best experience possible and this they did. We had a few logistical issues with the arrival of some of our party and these were dealt with beautifully. Mirko ensured that we made the most of every day and experienced some beautiful areas of the Croatian Adriatic. He was also very accommodating of our desire to meet up with friends on another Gulet at different times along the trip and we really appreciated this. Tash figured out pretty early on that we are an active bunch and ensured that no stone was left unturned with suggestions for onshore activities at every destination, all of which we embraced and loved. She also had an uncanny knack of knowing just when to suggest a gin and tonic might be in order. Stipe was unfailingly patient in taking multiple teenagers for multiple water skiing runs and anticipating our need for various water craft at different times of the day. Chef Zlatko created some of the most delicious meals we had on our travels throughout Croatia. His skilful use of beautiful produce ensured that every plate was empty after every meal – no small feat with teenagers onboard! Croatia is a beautiful country and to experience it on the Alba with Mirko, Tash, Zlatko and Stipe has created memories for a lifetime. Thank you all. We will definitely recommend your company to friends and family Ivana. Best wishes for the rest of the summer season. Ivana..We just arrived from our long vacation yesterday. In the name of all the group I would like to thanks you very much for all your support during the last 6 month when we started with this idea including the week on the gullet. Perla experience was so good!!! Crew always with good humor trying to adapt the trip to our requirements. Bosko..the great Chef !! Always with a new surprise. Tomy..multipurpose man !! Almost captain! He learned a lot of Spanish. Tania, the excellent feminine touch in the crew. Wheather…as you promised…excellent and ocean water…without words. Just one small thing to be improved is to know clearly in advance the exactly amount to be paid for anchor in harbour or into the bay as well as other services cost in order of not to have surprises at the end of the trip. Thank you Ana for such a wonderful Yacht and outstanding crew. Thomas and his brother Tony have been outstanding hosts. The skipper and his helper were enjoyed by all. Professional, attentive and courteous. We could not imagine better. I will certainly strongly recommend. Such a pity I didn't get to see you yesterday, I would love to have thanked you in person for the wonderful, friendly, professional service you provided organising our gulet holiday. You made the whole process so so easy!!! We had a fabulous time, the Alba was amazing, the staff so friendly and accommodating. We certainly will be recommending your services and Alba to our friends etc. seit ein paar Tagen sind wir wieder zurück in Deutschland. Wir wollen uns für die gute Organisation, die Zuverlässigkeit, den Zustand des Bootes, die Auswahl de Skippers usw. bedanken. We are sitting in Split Airport waiting for our flight home. Many thanks to both of your drivers especially the one who met us at Split in the heavy rain. He could not have been any closer to the disembark ment point which was much appreciated. You did a great job with the weather though it would have been great if you could have kept the rain away for a few more hours! We drove over to Krka np and it was as beautiful and special is you had described it. Thank you for recommending konoba Ziza we had such a special meal on Wednesday that we went back again last night during the electrical storm. We loved the villa and had a great time and I am.sure we will be back, after all I rubbed the bishops toe! Thanks again for all your advice and support which played a huge part in our enjoyment of our holiday. Dear Ms Karmen, thank you very much for whole support and help for this year charter. There were many changes during booking time and during sailing, but finally we have spent exciting and good sailing time. We came back to the Marina Hramina in "one piece" and without any problems as well as left boat in the same condition as we took. I hope that marina staff share my opinion too :-). Please send our great thanks to the marina staff for excellent service and help. They are nice, professional and helpful people. First of all I want to thank you very much for the present that you sent us through Ana from FS. We ware really impresed by your attention for us as customers. Thank you again for everyting you are doing for our hollidays. We really enjoyed ourselves - it was excellent. We have chartered 6 of the last 8 years in Croatia, and this was our best trip. The crew was excellent and the weather cooperated. You paid attention to detail and made sure that everything was as advertised, which I appreciate. I will contact you again and refer you to my friends. We recently spent a week on Andi from Split to Dubrovnik, Jul4 -11. I just wanted to let you know how terrific it was, right from when we started dealing with you by email, through to the end of the trip. You were so helpful at the beginning with all the emails back and forth, giving us discount when we organised a friend to come too, and then organising a taxi for us at the end of the trip. It was a pleasure to deal with you by email and gave us a lot of confidence. 2. Once arrived at Zaton, had a mini bus waiting for us to take us into Dubrovnik for dinner and bring us back….build it into the price….as Zaton was a bit small and quiet with nothing much to see, on our last night. Both these options would have required a bit less time to be spent swimming etc in the morning or early afternoon after lunch. So we thought we would just suggest that to you all for when you are planning the trip next time. We think the last day could have been improved….but not a big issue. We have told lots of friends about our wonderfully relaxing time on Andi and how the crew spoilt us…..just generally looking after us in many ways, and Ivan’s food was excellent. You didn’t actually need to feed us that much! So please pass our thanks on to Ivan, Ivica and Robert. We will remember them fondly, together with Andi and the beautiful Dalmation coast of Croatia. Thank you so much for your kind assistance with booking the yacht for us this summer - we had an amazing vacation! Hi Karmen, we had a wonderful trip in Croatia. Tomas and Matea (crew) were both great and your country is really beautiful. We would just like to thank you for helping to organise a brilliant holiday we enjoyed last week. We encountered a problem with the motor boat which was originally assigned to us but the Base Manager - Dino and his team made every effort to ensure that our holiday went smoothly. I would be grateful if you would pass on our thanks to him. He obviously has a demanding job but took time to sort out our holiday and provided us with excellent customer service. We would have no hesitate in re-visting the B.Y. Centre. Croatia is a beautiful country. Everyone we encountered was genuinely friendly and you all seem to speak perfect English. Thank you to you and the team at B.Y. ; we will be back next year. My holiday is coming to an end and I wanted to thank you for making all the arrangements. The villa was lovely and ended up perfect for the group. Mrs. Dubravka was an amazing host and really went out of her way in making our stay as pleasant and enjoyable as possible. My birthday celebrations were spectacular. We all had an amazing time and plan on coming to Croatia again. So once again a big thank you for helping me out. Apologies it has taken me so long to get back you, it has been all go since the holiday! I just wanted to write to you to thank you so much for everything - you were an absolute pleasure to deal with at every step and the trip itself was like something from a dream - everything, from the captain, crew, locations, food, accommodation were just better than we could ever imagined. Each of our 14 guests were totally thrilled by the holiday and it was absolutely the trip of a lifetime. Siamo partiti e abbiamo lasciato le chiavi alla vostra incaricata (molto gentile e disponibile). La nostra vacanza è stata piacevole e tutto è stato ok. Brava anche la sig.ra Samanta delle pulizie. Grazie di tutto e alla prossima volta. Ich möchte mich ganz herzlich bei Ihnen bedanken für den immer prompten "Service". Jede Anfrage von mir bei Ihnen wurde sofort beantwortet, immer kompetent und zuverlässig und natürlich war es ganz toll, dass Sie so super gut deutsch schreiben. Wir sind nun seit ein paar Tagen zurück aus Kroatien und haben unseren Aufenthalt in den Häusern Luigi & Luisa sehr genossen. Auch vor Ort hat alles wunderbar geklappt und die Vermieter sind äusserst liebenswerte Leute und haben sich hervorragend um uns gekümmert. Hi Karmen,We just wanted to thank you so much for doing such a great job of organising our holiday. We have had a wonderful time and skipper Tonko has been really great. I want to express on behalf of my family and myself our satisfaction for the excellent week we have spent on m/y Luna thanks to a competent and friendly crew who has made of our vacation an unforgettable experience. We have enjoyed a beautiful sea and delightful tiny villages along the Dalmatian coast that have really impressed us. I wanna to thank you to my charter in Italy (in June from Piombino, yacht Mythos). Yacht was in extra condition! I am writing this email to say a big thank you for all your efficient and professional assistance in organizing an absolutely wonderful holiday in Croatia which we will never forget!!! The boat Kadena was perfect for six couples and the crew were unbelievably professional , helpful and very competent. The food was outstanding and the whole crew worked so hard to accommodate whatever we requested and nothing was too difficult. I can honestly say everybody on board had an amazing cruise and I would highly recommend the Kadena to anybody who wished a reference. Thank you again for all your help, and I only hope I can get back to Croatia again and enjoy your amazing country and friendly hospitality!! What an incredible adventure we have just had cruising the stunning Croatia coast. The biggest thank you and hvala to the team from the yacht Anna Marija ... Marko, Ante, Tomislav and Ivana from Croatia Charter Holidays. It was a pleasure cruising with you. You have given us many very beautiful and special memories. Hi Ivana, Just a quick note to say thanks for setting up a great sailboat charter for us especially for finding Davor as skipper. He really made the week a great experience for us. We love to sail so he gave us lots of helm time but took over when we needed a break. Some great tips on where to go and we loved the vineyard dinner on Vis. Davor was really nice with our kids as well. Just to say we had a wonderful time, lovely boat, great shore crew. Prefect! Hi Karmen, Just a quick note to say thank for all your work in arranging our sailing holiday in Croatia. We all enjoyed the whole experience and please say thank you to the team at Marina Frapa, everybody was very helpful. Will recommend the Croatian sailing holiday to our friends and anyone who should ask about the time we had in your country. Once again thank you. Hi Karmen, thank you so much for your help organizing our Holiday. We had the best time and villa in Mlini was amazing. Thanks a million. Anyhow... The cruise on Andi was absolutely wonderful, and everyone loved it. The crew was excellent and most accommodating. Thanks again for all your assistance. Have a wonderful summer. I will highly recommend your services to others in America. R. & Z.T., May 2014. We are sorry to answer your email just now, few days after having received your nice remarks and wishes. Everything happened like we had expected, since a very well organized welcome in Split to a special Catamaran with a crew not only well educated, but also very professional. Any way we have had an excellent experience on the Lagoon 560 and certainly we will recommend this smart alternative to spend good times in this unbelievable Disneyland of the sea giving your contact to some friends if you allow us to do it, of course!!! Once again thank you for having organized our week in Croatia and don't hesitate to contact us if you need to give any reference to your clients. On behalf of All of Us, we would like to thank you for the excellent service and Jeanneau 57 charter! Our trip was great, we had a very good time and we would especially like to compliment the base for their professional and friendly service. ich wollte mich nach unserer Rückkehr von unserem Segeltörn noch mal bei Ihnen für alles bedanken. Es hat alles wunderbar geklappt, das Schiff war perfekt und die Charterbasis vor Ort kann man nur wärmstens empfehlen. We had an excellent vacation aboard the Gulet Anna Marija despite the not so great weather. The crew was fantastic!!! Captain Marko, Ante and Mate were just excellent. The meals were fabulous and Ante was very attentive to our needs making sure we were well taken care of. Overall they were a lot of fun to have around! We could not have asked for a better crew! I hope they have arrived safely back in Split. It was great to meet you at the start of our voyage. Thank you coming to see us off. Thank you also for arranging the transfers for us to and from the boat. That worked out great. Feel free to share my contact information with any potential clients if they have any questions or you need a recommendation! We would love to return to Croatia soon and hopefully spend time on the coast perhaps traveling north of Split or Zadar again aboard a gulet. All the best to you and the crew. If any of you are ever in Chicago give me a call! Spoštovana ga. Ivana, hvala vam za pomoč i dobro dijelo kod rentanja jedrilice u Baški Vodi. Lijepo smo se proveli. Sve je bilo uredu: vrijeme, more, vjetar, posada... Mogu reči da bi jedrilica mogla bit "za svoje godine" malo bilje održana i opremljena, pošto nije bila ni baš jeftina za kraj sezone. Ali agenciji nisam dao primedbi osim tehničnih, makar sam se uverio da su Bavarije najbolje. Hvala ponovo i nadam se na suradnji iduće godine. Prijetno! Bepo was delightful. We thoroughly enjoyed his company and knowledge. Thank you very much for your help making our visit a pleasant experience. dopo diversi giorni dal rientro dalle vacanze, le sto scrivendo per ringraziarla della professionalità dimostrata e per dirle che tutto è andato per il meglio. Dear Karmen, My husband and I want to thank you for organizing our family's first sailing trip to the Dalmatian Coast. Our holiday was just wonderful. The marina team was welcoming and made the check-in process easy and very clear. Our skipper, Josip, was friendly, knowledgable and just a pleasure to work with. He offered us an interesting itinerary that allowed us to visit an island each day-we thoroughly enjoyed the beauty of Croatia-its landscape, people, food and sea. The boat we chartered, Violetta, was super. We had a few small, but worth mentioning, problems with it. The toilet on the starboard side did not have working lights and smelled very bad. The cabinet where the glasses and plates were stored, was missing some of the restraining pegs and the dinner ware moved alot during our sailing. Other than that, we were happy with the boat. Again, many thanks for your help in planning our memorable family vacation! Hello, Karmen!Thank you for your prompt reply. Parts arrived today and all our team is happy today. Karmen, you did a wonderfull work to ensure our great time in Croacia. we are all back in Uruguay now. Just wanted to say Thanks! for all your work and support to make our stay in Croatia "the best"
we really enjoyed everything, gulet Kadena was great, captain and crew were more than kind and efficient. And you have a wonderfull Country!! Our group has returned to Australia and we just wanted to say a huge thank-you to yourself and Teo for such an amazing trip! Without Teo, our trip would not have been nearly as good as it was. He took us to the most amazing places and ensured that we experienced the true Croation culture. He did a great job at fitting in with our group so that it was like we were sailing with another friend. I will be sure to recommend both him and yourself to friends who wish to go sailing in the future. We are back from our holiday and I have been so excited to write and thank you!! 1) Check-in: Although there were lots of people checking in we were the only group who had completed all of the necessary paper work, so we simply paid our money and were off to the boat. I put this down to your organization as you arranged all of the paper work for us which made it so easy! 2) The Skipper: I cannot sign Teo’s praises enough. He was incredible! A credit to the industry. The skipper definitely makes the trip. The places he took us to were just incredible, he made us feel safe and comfortable at all times and was also great company when he joined us for dinner occasionally. He was also very good at knowing when it was time to give us our space as well. 3) The Boat: Nautitech 40 is a great boat, however, next time I would go a size up, it was just a tiny bit small for the 6 of us (three tall men) and I suppose with the wet weather it made it feel a bit small, but the boat itself was well equip and very enjoyable. All in all I cannot thank you enough. What a great company, we hope to do this again in the coming years and without a doubt will be contacting you! I would also recommend your company to friends and family as it is a great way to see Croatia and with your company it is just so easy! I will also write a review and information on some travel sites as when I was starting to plan the trip I didn’t know where to look and how to trust. However in the end it is just so easy!! Thank you again. I will email you links to the sites where I do some write up. Take care and I hope to deal with you again in the future. Hello Karmen, Just a quick message to say thanks for your help in organising a great trip. I will definitely recommend your company to friends looking to travel to Croatia. Guten Morgen! Wir haben einen wirklich schönen Urlaub in Istrien gehabt und das Haus war wirklich toll. Danke für das gute Organisieren! Hi Karmen, Just a quick note to say thanks very much for all your support for the holiday! Everything worked out well - very hot (! ), great boat, wonderful islands and snorkeling, good marina management - and the San Antonio Hotel was fine (except for the beach - why do all these hotels destroy their beaches by putting stones on the sand - a bit crazy!). Hi Ivana, they were very happy again, all new people on board were also amazed by the boat, crew, service, food etc. I saw few photos and missed Libra for a moment very much and were soooo sorry I couldn’t make it this year!! Special thanks to you form my parents for your help and assistance, and regards and many thanks to ''our boys'' as my mother said. Buonasera Karmen, Volevamo ringraziarti per la fantastica casa e sopratutto ringraziare il proprietario Mario per la gentilezza e la disponibilità. Grazie,a presto. Dear Ivana, We are back in Hong Kong now having had a most wonderful time in Croatia and we'd like to thank you very much for making all the arrangements for us! Everything was super! Hallo, unser Urlaub ist vorbei...es war sehr schön...Vielen Dank!! Wir würden gerne für das nächste Jahr uns Informieren. Villa Lantoni was a real treat but even better were the hosts who made our entire stay extremely special. I felt that we were visiting friends. My birthday party was much more than anything I could have expected. So thank you for finding these people for me. Dear Ana, I have received feedback from the client. Mr. A. and his family liked villa Luna very much. It was enjoyable holiday with a lot of unforgettable impressions. Thank you very much for your cooperation and huge done work. It was my pleasure to work with you. Dear Ivana, Just to let you know we have had an excellent time on your boat: what a beautiful, friendly country you have! Thank you once again for a lovely week and thank you very much for your excellent service. Ivana - thank you so much for all of your help for our trip, we had an amazing time! Everything was very well organized including the Montenegro trip so thank you. Mrs Dubravka is great. We had few issues with the house but I will send you a note on those later. Anyway, wanted to let you know that and thank you again for all your help in planning our wonderful trip. Hallo Frau Dujmovic, Wir sind wieder zurück und ich wollte nur kurz sagen dass alles perfekt war. Wir haben die Tage sehr genossen. Herzlichen DANK! Guten Tag Frau Ivana, Danke Sie für ein tolles Boot, es war super! Karmen I just wanted to thank you for all your help with our bookings for the yacht, transfers, car hire etc for our holiday to Croatia last week. Everything worked out really well and it took all the stress out of it for us. Many thanks!!! It’s always been a pleasure dealing with you and I hope we can book another trip with you for June or Sept next year. Hi Karmen, Just a quick note to say thanks. We had a great experience. The boat was great, the weather perfect and it was a great week. Thanks again and I'll be back. Hi Karmen, We have just arrived back in Australia, but I wanted to thank you for organizing a wonderful trip for us on the gulet Libra. The crew were truly wonderful....Bojan, Karlo, Ivan & Zlatko were amazing & provided us with a fantastic week on the boat. Both J & I were surprised with the wonderful company & fantastic food on the boat. It was a great experience & we would love to do it again in the near future. Hi Karmen, We have had the most amazing week. The crew have been absolutely fantastic. Everyone has been so friendly and they have been so keen to ensure we all had a good time. The food has also exceeded all our expectations too. We will be telling everyone back in Sydney what a terrific gulet the Libra is and we are already thinking about rebooking in the future...let's hope. Thank you for all your care and assistance too as all your effort has helped ensure that our trip was the most successful trip. Croatia is such a beautiful country. We hope to return some time soon. Draga gospođo Ivana, mi smo se vratili s odmora. Htjela sam vam se samo zahvaliti za perfektnu organizaciju. Hi Karmen, Just a note to thank you for all your arrangements for our wonderful holiday onboard LINDA! What a fantastic week we had with Toni and the crew. We will never forget what a great experience they gave us, from Nada's fabulous cooking, Goran's attention to everything, Rocco's boating experience and Toni's expert professionalism and wonderful personality, we really enjoyed ourselves. Guten Tag Frau Dujmovic, Wir sind gut wieder in der Heimat angekommen und hatten in den Ferienhäusern sehr schöne Urlaubstage. Wir waren mit allem sehr zufrieden und auch erstaunt über die große Gastfreundschaft, die wir erfahren haben. Hi Karmen, Thanks for all the help! We are safely back in South Africa. You have a BEAUTIFUL country & we hope to visit it again. Hi Ivana, Just to let you know that we all thoroughly enjoyed our stay in Dubrovnik and the villa was amazing. The owners were so accommodating and welcoming. Thank you for helping me out. Danke und bis bald, diese Villa ist wirklich ein Traum und die Eigentümer perfekt, wurden mit Griller mit Beka (Fisch) bekocht, also wirklich super!!! Hi Karmen, Thank you for your attention in looking after the car rental details. We had a wonderful two weeks exploring the country by land and just finished day two of sailing to Vis and Palmizana/Hvar. Krka National Park was beautiful and it was exciting to swim by the waterfalls. We also visited the Blue Cave today. Thanks again for organizing such a wonderful experience for us! Hi Ivana, Just a quick e-mail to tell you that our sailing week was wonderful and we were very happy with the boat. Croatia is a wonderful country and we really enjoyed it. I just wanted to let you know that we were very happy with services and Yoshko (the guy who gave us the boat, I don't know how to write the name) trip recommentations were really helpful!! I will be really happy to recommend your agency services if anyone of my friends will need it. Thank you very much again for everything. Buongiorno, è andato tutto molto bene! siamo rimasti molto contenti della barca e del servizio. Hi Ivana, I must say your response and service has far exceeded other companies, so thank you for that. I'll be in touch as soon as I can. Buongiorno, Qua da Villa Chondrilla tutto ok stiamo benissimo, molto bello! Non manca nulla ottimo servizio. Era passato il tecnico per la TV perche'venisse a ripararla ma non occorreva l avevo messa a posto io bastava solo sintonizzare il decoder. Un saluto e grazie mille! Thank you so much for your efforts with the hotel & nautical book. The marine office were most helpful and have loaned me charts and pilot book, so all ok now. We adore the apartment and boat by the way! Many thanks again. Thank you for organising Sun Odyssey 49 for us recently. We had a great 2 weeks sailing trip on her. Dear Ivana, let me thank you for the wonderful holiday we had in Villa Krug. Dear Ivana, the boat you proposed is the best boat we ever had. We're enjoying it a lot and it's just the beginning of our holiday. Thank you very much for your perfect service! Thanks ! Good Home in Orebic. And we all have agreed to do it again next year. As you may know, I had an accident with Bavaria 55 during ancorage in Primosten night to friday 22/7. A sudden hurricane wind during night dredged us into another boat so our bathing-platform got damaged. It all went so fast that my reaction was to late. I feel VERY bad about this, even though we paid up with the intire deposit. I have sailed damage-free all over Europe for 17 years now, so this gets to me pretty bad. I know I have caused the base-crew alot of work with the boat, but sometimes things just go bad... I really hope that this will not interfear with our relation-ship in the future, and that next year we can repeat our fantastic journey with Bavaria 55. Hi Ivana! Ours was a wonderful vacation, and the Villa and its owners Iolanda and Ivo were great!!! What a Fantastic trip. The whole experience was superior. The boat was very comfortable and clean. We loved the skipper and hostess. They were on top of everything. Super nice and resourceful. They helped us design our trip and gave us recommendations for places to go eat and they were great. And finally, Ms. Ivana was amazing. She was very helpful and went out of her way to help us with all. So we give this trip a perfect 10. The holiday was great fun. I just want to thank you for helping us to spend an excellent time by sailing in Losinj. Base people were helpful, and the boat was in good condition. Although the marina is a bit exposed to the waves generated by the boats going in and out of the town marina and the nearby gas station, the facilities were adequate and cleaned frequently enough. We had free wifi internet connection in the marina building, so we could check the weather forecasts, emails etc., although the signal was not strong enough to cover the area where the boat was moored (so we had to go to the building). We had an excellent weather, the fronts active over the continent could not reach our area. Thank you for your visit on our day of arrival and beautiful gift - it was very tasty :) Once again thank you for helping us with arranging this amazing holidays, working with you is always a pleasure! Please also say thank you to Bojan, Karlo, Ivo and Zlatko for excelent service and assistance in any matter during the cruise, they are really a perfect crew on a perfect boat! We hope to use your service next year. Thank you for all you did for us. We had a fantastic time.Our skipper was exceptional, very professional. Loved sailing, Hvar a favorite. Korcula very special. Hit the right moment in Dubrovnik for opening of the Festival with opera and fireworks. Wow. We wished you to thank for good rest in your amazing country! Country house simply amazing, a kind wonderful! Thanks you for the help in car rent! We will necessarily recommend you to all our acquaintances! Good luck to you! We now arrived back in Germany from our Katamaran trip in Croatia. I just wanted to thank you again for your arrangement, the Katamaran was terrific, clean and fully equipped. The Skipper organised at short notice in Sibenik was also very nice and experienced person. The place was wonderful and we really enjoyed our stay in Croatia :) Must say that Mrs. Angela at the villa was very helpful as we had a few difficult moments (firstly A. was ill and then our brother and sister have run out of petrol and got stuck in Bol). Please pass our many thanks to her too! Charter service was wonderful, bout was very nice, just the weather was rainy and windy! Thank you for your services, and we wait our next holliday in August! We had a great week at villa. I think the recommendation was excellent for us- a quiet country location, big spacious garden, privacy. Just what we wanted. The villa was superbly refurbished- very stylish, authentic and tasteful, as well as being well-equipped. One of the best villas we have ever stayed in! The garden, pool and outdoor cooking area were great and much enjoyed by our boys. The only disappointment was that there was no DVD player as we had brought some DVDs for the boys in the evening, and the lack of A/C in one of the bedrooms. Even a fan would have been better than nothing as it was very hot. Otherwise, everything was fine. We will be in touch with you for next year when we are thinking of a gulet boat with crew for a crowd of about 10 people! I really appreciate it, please tell it also to the skipper!! Vorrei con la presente ringraziare e fare i complimenti da parte mia a lei ed a tutto lo Staff con il quale sono venuto in contatto in quanto ad efficienza, cortesia, disponibilità ed educazione, senza ovviamente dimenticare l’efficienza e lo stato dell’imbarcazione che era assolutamente ottimo. We have just returned from Croatia and would like to thank you for your help in finding the most appropriate boat and charter company for us! We spent an excellent sailing vacation and the weather was also very good for us as family sailors. Thank you very much for your help and assitance in arranging our holidays! We had great time and beautful holidays, great weather, the boat was amazing and the boys from the crew were just excellent! Please thank them again from all of us and send warm greetings! Just wanted to let you know how the trip went and from all 8 of us it was fantastico we really loved sailing Croatia it was wonderful. You really have a wonderful country , the island are so beautiful , the food so fresh and so healthy and the ancient cities so interesting, it was sad to leave but we managed to have an extra 6 days on Kortula Island where my friend has a wonderful place on the water. Thanks again for all your help, you are a real asset to your company and I hope you boss realizes this !! We look forward to the next trip we do with you again hopefully next year. We arrived yesterday to home from Croatia.The study trip was excellent, everything was OK, so thank you for organization. I hope I will go to back to Croatia with my family or with the students. If yes, I will contact You.